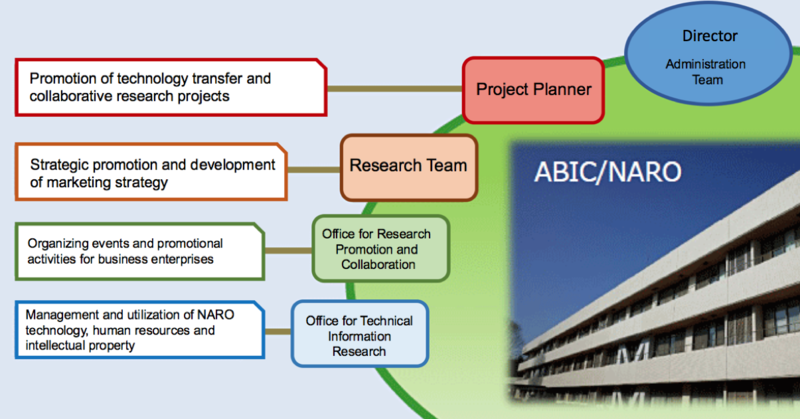 The NARO Agri-Food Business Innovation Center (ABIC) was established as part of the re-organization of the National Agriculture and Food Research Organisation (NARO) to advance NARO's research achievements and address the current trends in the global agri-food industry via efficient technology transfer and collaborative research projects, development of viable marketing strategies; promotional activities and events aimed at business corporations; and efficient management and utilization of NARO technology, human resources and intellectual property rights. On April 1, 2016, the National Agriculture and Food Research Organization (NARO) was reorganised into a new national research and development agency to address various issues affecting the agriculture and food industry while responding accurately to structural changes in the economy and the needs of society. The new NARO aims to strengthen the collaboration between industry, academia and government to facilitate immediate implementation of research output to society. To achieve this goal, the Agri-Food Business Innovation Center (ABIC) takes the lead in the implementation of this objective and drives market oriented research.